People used to be pretty skeptical about exchanging love instead of cold, hard cash. They talked about love like it was some kind of flower (not exactly legal tender). They complained about being unable to pay the bills, no matter how much affection they felt for another human being. They bounced a few checks, so to speak. Some of the rougher crowd used a lot of complicated metaphors involving games of poker and the luck of the draw. Let's just say that their romantic enterprises didn't seem to offset their gambling debts. To those people, it must seem like we're living in an impossible future—a future filled with gleaming Gold Love Necklaces like this one. How did we get here? Nobody seems to remember. What does it mean? Don't look at us: we're just humble purveyors of fine Halloween costumes. 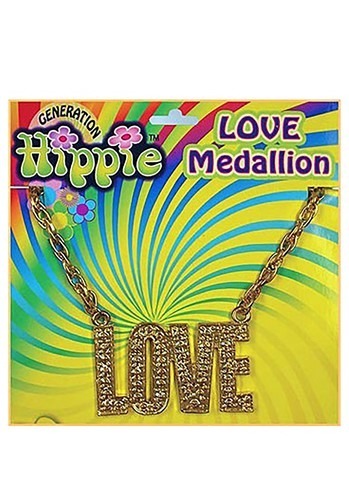 Since so many people are still singing about love, money, gold chains, and hardscrabble origins, we can only assume that this neckless is timeless, valuable, and possibly very useful. But it's up to you to decide exactly how it should be used.